GetSelectList – which has four overridden method and it returns a list of SelectListItem which can be used to further populate the dropdown in UI. IsValidForEnumHelper– This method also has two overridden method that tells whether the passed type is enum. This should be used to check the type of passed value and GetSelectList should be used if IsValidForEnumHelper returns true. So let’s jump to the example and use the above methods. but as we know that enum properties can not include space or some special characters. 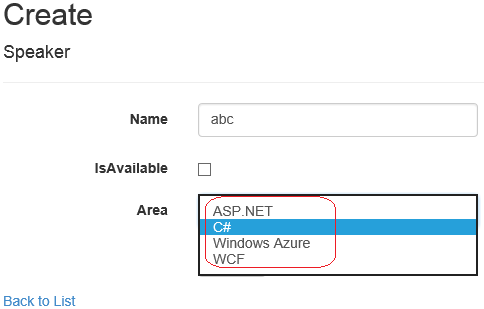 Say, if we want to display WindowsAzure as Windows Azure or ASPNET as ASP.NET etc. In this scenario, we need to create custom views for edit and display purposes. – If the type itself is not an enum then use the normal value. Make sure that above Partial View enum.cshtml is created in EditorTemplates folder under the Shared directory. So if we see the above code, then we find that EnumHelper.IsValidForEnumHelper is used to check that whether the passed value is of enum type and the other one EnumHelper.GetSelectList which returns the list of items in SelectListItem type as discussed. Here the earlier issue is resolved and we are able to see the consistent values on diffrent CRUD screen. We can write the similar custom code in other scenarios as well. This entry was posted in ASP.NET MVC, ASP.NET MVC 5.1, Visual Studio 2013 and tagged ASP.NET MVC5.1, enum, Update 2, VS2013. Bookmark the permalink. Both under EditorTemplates folder ??? ?